This Stand for iPad Is the Ideal Modern Touch screen Podium. Apple Devices Are Widely Used In Business Settings, this Mount is Great for Presentations. To Blend in With all Environments this Stand for iPad has been Finished in an Elegant Black Color. We're sorry, but this product is discontinued and is no longer available for purchase. 360 Degree rotation for landscape or portrait orientation. Flexible 36° to 180° rotation between two arms and adjusting height top leg to suit iPad Generation 1, 2, 3, 4, Air and most 7"-10" tablets. Black finish for a sleek appearance that suits nearly any environment. Floor standing base is weighted for stability while in use. Height adjustable for users to set at the ideal viewing level. This stand for iPad is a modern podium for digital presentations. Accessories for tablets provide a hands-free holder. This stand for ipad that has a black finish is modern and suits nearly any décor. 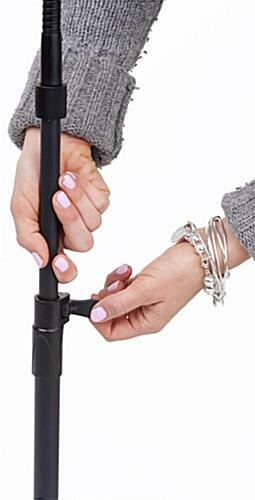 The height adjustment and flexible arm allows users to utilize this holder from a standing or sitting position. 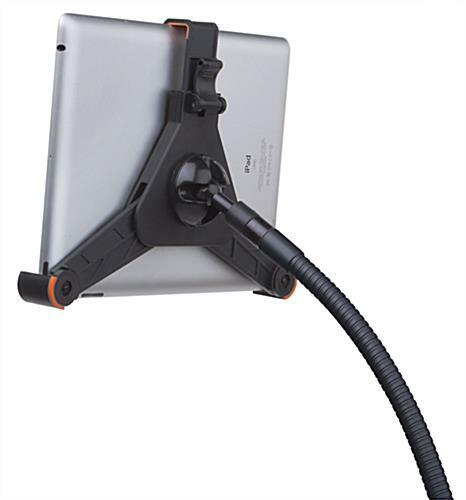 This adjustable stand for ipad is versatile and allows users to adjust according to individual needs. These Apple® tablet displays are offered at a great price. The weighted base is stable to ensure that this stand for ipad will stay firmly in place. Affordability and versatility are just two great attributes to this tablet holder. The legs on the tablet mount of this stand for ipad rotate to fit different sized tablets. This display features a telescoping pole to allow for a height range from 26"h-58"h (to center of tablet mounting bracket). This stand for ipad does not include a locking mechanism but can be used with the Kensington cable lock or Lock Adapter Kit (sold separately). Apple® tablet accessories such as these can often be found in residential homes, banks, retail stores, tradeshows and more! This floor stand for ipad, also known as a digitalpodium, can be utilized with Apple TV or other mirroring applications. The mounting bracket rotates 360° to switch from vertical to horizontal orientation with ease. This apple accessory, stand for iPad that has a flexible arm can be adjusted to the perfect viewing height. The square base is designed for stability, providing a durable hands-free tablet holder. This tablet holder is constructed of steel and plastic for a lasting fixture. Each tablet display is simple to assemble with easy to follow instructions included. The many adjustments are ideal when this display is being used in many different locations. This unit holds generation 1,2,3,4 & Air apple® tablets as well as many 7"-10" digital displays. The sleek design does not take up much floor space, which is ideal for smaller spaces. Users can find all tablet display needs right here!